Home / Boko Haram / News / Terrorism / The End of Boko Haram: Khalid al-Barnawi arrested by Nigerian Military. The End of Boko Haram: Khalid al-Barnawi arrested by Nigerian Military. The Nigeria Military has done a great job so far fighting Extremism, Few days ago one of Boko Haram leader khalid al-Barnawi was arrested by Nigerian Military in Lokoja. 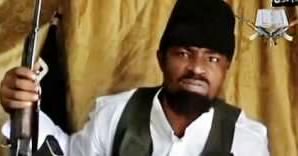 Khalid al-Barnawi is an influential leader of terror group Boko Haram and leader of its dissident splinter group, Ansaru. The capture of Ansaru leader Khalid al-Barnawi is a good sign that Boko Haram activities in Nigeria will soon come to an end as more and more fighters have been arrested and others are Surrendering to Nigerian Troops.